Ahhh, home sweet home. Who doesn’t enjoy the comfort of their own humble abode with a place for everything and everything in its place? Well, some of us may not be that neat and tidy, but most of us at least appreciate the comforts our homes afford us when we’re able to be there. And humans aren’t the only ones that appreciate a cozy environment; animals do, too — especially animals that have been domesticated to some extent. There are few creatures that enjoy their homes more than burrowing animals, though, and ferrets are one of them. 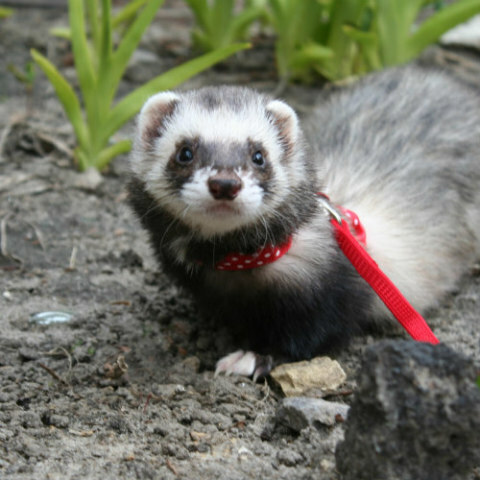 If you keep ferrets as pets, it’s important to provide them with an environment that is clean, comfortable and nurturing, not to mention stimulating and safe. That’s because they’re naturally curious creatures that need some kind of stimulation, or they can get into heaps of trouble. They are also natural escape artists, due to their ability to climb and their extremely clever minds, so you’ll need to make their homes escape proof as well. The first place to start for this is by choosing the right cage. 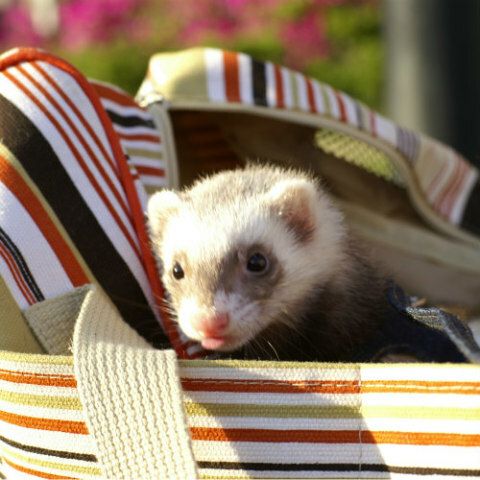 Because ferrets are chewers, you’ll want to avoid plastics and natural materials such as wood. That means a metal cage with plenty of room for them to roll around in and explore. The best ferret cages have multiple levels and roofs or doors with latches that can’t be breached. The more room you give them the less likely they are to become bored or despondent. There’s nothing worse than a bored ferret, and nobody wants to see them, or any other furry creature, depressed. With the wonderful pen options most pet and feed stores now carry, you can even make your own with the right hardware. As the saying goes, location is everything, and that holds true with almost any spot you’re going to expect your pets to call home. 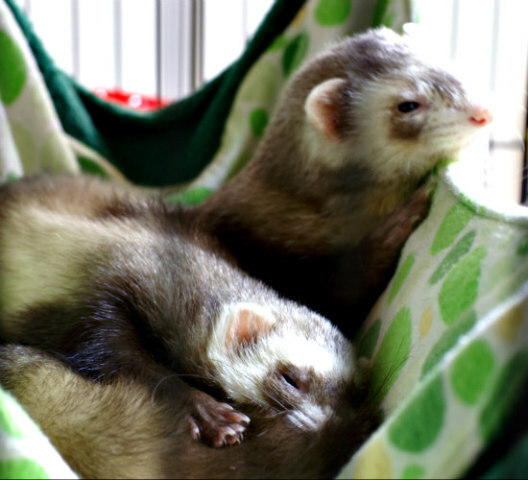 First off, your ferret’s cage should be located in a dry, cool and shaded area that doesn’t receive direct sunlight. This is actually crucial. Due to the fact that the animals’ sweat glands are not well developed, ferrets don’t tolerate temperatures that exceed 80° Fahrenheit very well at all. It’s also necessary to change their bedding every few days to prevent odors from building up (they can be stinky), preferably using an unscented material. This is where the importance of cozy comes into play, because the mischievous little buggers can sleep anywhere between 15 and 20 hours a day. They love to curl up and burrow into and under comfy materials, so provide them with a blanket or, better yet, one of those pet beds that’s essentially a pocket that they can crawl into and hide or shield their eyes from the light during all that snoozing. Hammocks are another type of bedding they enjoy. Hang one up and see how fast they use it. You’ll also want to give them some toys for stimulation. Because ferrets can be grazers when not sleeping, make sure they have access to plenty of clean water and something to nibble on. The only thing worse than a bored ferret is a hungry, cranky ferret that’s bored. Change their bowls or bottles out daily so that their refreshments are always just that, fresh. That’s really about all it takes to keep your ferret happy — that and human interaction. Don’t leave them locked up for extended periods unless they’re napping. Let them spend some time exploring non-restricted areas of your home under your supervision. This allows for the much needed movement and companionship they require.